Many of the sports we play and watch today have fascinating etymological histories. Below you will find some of the freaky, funny, intuitive, and counterintuitive roots in the world of sport. The word “sport” itself has been around in the English language since the mid-15th century, when it was derived from the Old French desporter, meaning “to amuse, please, or play.” As a noun denoting a physical game or activity, the word grew in popularity in the late-15th century, also acquiring, in the 18th century, the designation of a pleasant and interesting person – a “good sport” – from the glamorous lifestyle of gambling and betting. There is a host of activity that poses no difficulty in parsing out its meaning and etymology: Basketball takes its name from its 1892 invention as an indoor game played on a rainy day in Springfield, Massachusetts. Similarly, baseball became a household name in the 1840s, although a similar game had been played earlier under the name of “rounders.” Football poses a bit more of problem, as it refers to a multitude of sports. While games in which a ball was kicked on a field date back to Roman times, if not earlier, the game known as soccer in the United States and football elsewhere first became a national pastime in England in the 17th century. 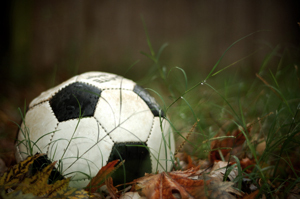 In the 18th century, the rules of the game were codified and a number of football associations were formed. In fact, it is an abbreviation of the word “association” that gave rise to the term “soccer.” Originally, the sport was called socca, later transforming into socker, and finally soccer in 1895. The similar sport of rugby derives its name from the central-English city of Rugby, the site of the first match in 1864. The etymology of other sports is not quite so easy to discern. Golf, for example, takes its name from the Scottish word gouf, meaning “stick, club, or bat.” The Proto-German origin of that word is kulth, and refers to the rod-shaped clapper of a bell. Similarly, hockey draws on the shape of the stick used in playing, from the Middle French word hoquet, meaning “shepherd’s staff.” The name of tennis is a gift of the French language, too, and most likely stems from the command tenez, meaning “take, hold, or receive.” One final French derivation is the game of lacrosse. Originally called jeu de la crosse (“game of the hooked sticks”) in French, a version of the game, called baaga-adowe, was also popular among the Algonquian tribe of North America.